LTYC's Ugotta Regatta is a fun celebration on the gorgeous waters of Little Traverse Bay where some of the best sailing in the country just happens to be! The Ugotta Regatta begins with one design racing Friday. The weekend's festivities kick off bright and early Friday morning with a fun tradition: a long line of happy people beginning at sun up outside Irish Boat Shop to purchase the 2018 Ugotta Regatta t-shirt. Each year, the shirt design changes and with a limited number produced, the lines begin early so that the shirts can be had. Friday night finds a welcome to Harbor Springs celebration at the Irish Boat Shop. On both Saturday and Sunday mornings, the Little Traverse Sailors Race Program hosts a pancake breakfast, open to the public, at the Yacht Club. One highlight of the breakfast: the Junior Racers flip less-than-perfect pancakes over their shoulders to land on the roof of the sail shed behind them. 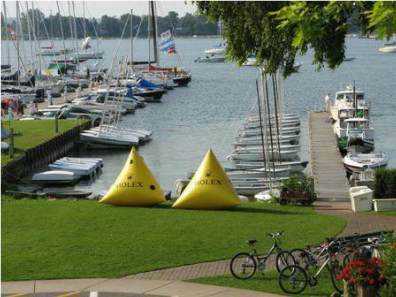 LTYC hosts parties at the Yacht Club both Saturday and Sunday afternoon for Regatta participants. With approximately 100 sailboats participating in the 2018 Regatta, the event brings to Harbor Springs hundreds of crew members and their families. Race watchers either head out onto the water in power boats or watch from the Petoskey State Park or Petoskey's Sunset Park. The Petoskey Area Visitors Bureau is the sponsor of this year's awards--thank you!